Most of our Kitchen Confessions involve food. Whether it be baking, cooking in the crock pot, or warming up a pre-made frozen meal (only half kidding with that one) it is all about things to eat. Today's post is all about something to drink! Us Mamas (and the dad's, too) love a little cocktail now and then and we were recently introduced to a new favorite of ours, the Moscow Mule. We first tried them on our Asheville trip and I was totally intrigued by the copper mug these drinks are served in. Sure, you could drink them out of a regular cup, but there is something about the copper mug that make them taste that much better. After having them in Asheville, Jen and I got the idea to give our husbands copper mugs for Christmas, along with all of the ingredients to make these fun drinks. If you haven't heard of them, don't let the funny name fool you. This drink is trendy, hip and on every drink menu around. The most basic recipe includes vodka, ginger beer, and lime juice served over ice in a copper mug, but there are many variations of this popular cocktail, making it versatile enough for every season or occasion. I've seen recipes including watermelon to pomegranate and everything in between, but so far all we have tried is the original recipe. Fill mug with ice. Add vodka and lime juice, then ginger beer. Stir to mix and garnish with a lime wedge. Enjoy! After I did a little googling about the drink and the recipe I discovered that this cocktail actually wasn't anything new at all. It was invented in the 1940's. A vodka brand owner was having a hard time getting Americans to drink vodka and a friend of his, who was a bar owner, was also having a difficult time selling the ginger beer he'd been brewing. A third friend of theirs owned a struggling copper mug company. These three combined their products and the drink was born. Another interesting fact I learned when reading up on this drink is that ginger beer isn't really beer at all. Some versions do have a small amount of alcohol in them, like the original did in the 1800's in England, but most are not alcoholic at all. Think of it like ginger ale, but not ginger ale. I know, makes total sense, huh? 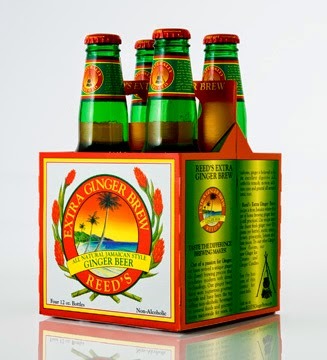 Ginger beer has more of a "gingery" taste because it is actually brewed and ginger ale is pretty much just a carbonated beverage made from water and ginger flavor. I'm telling you this because if you go searching for ginger beer at your local grocery store you probably won't be able to find it. I had to hunt and after a little research I discovered that Trader Joe's carries a brand called Reed's, but you can find a lot of options on Amazon HERE. As for the fun copper mugs, they are popping up everywhere, but the best deals Jen and I could find were again on Amazon. Jen got THESE hammered copper ones and I ended up with THIS smooth version. There are tons of different options to choose from though. Click HERE to see them all. Most anyone you ask will say that the "it" drink of 2015 will be the Moscow Mule. It may have been invented long ago, but it is certainly making it's comeback this year. Cheers!